Towering trees, fresh air, and the crisp scent of nature – these are some of the amazing experiences nature lovers will enjoy in Bandung. Filled with stunning mountain views, volcanoes, and hot springs, Bandung is a nature lover’s wonderland! Besides visiting beautiful nature reserves and trekking along scenic trails, you can totally immerse yourselves in nature when you book a stay in any of these 11 unique bandung forest resorts and hotels. From outdoorsy lodges to luxurious resorts, these unforgettable hotels are perfect for those looking for a nature’s retreat. Imagine waking up to a mountain view and the fresh scent of foliage every morning! 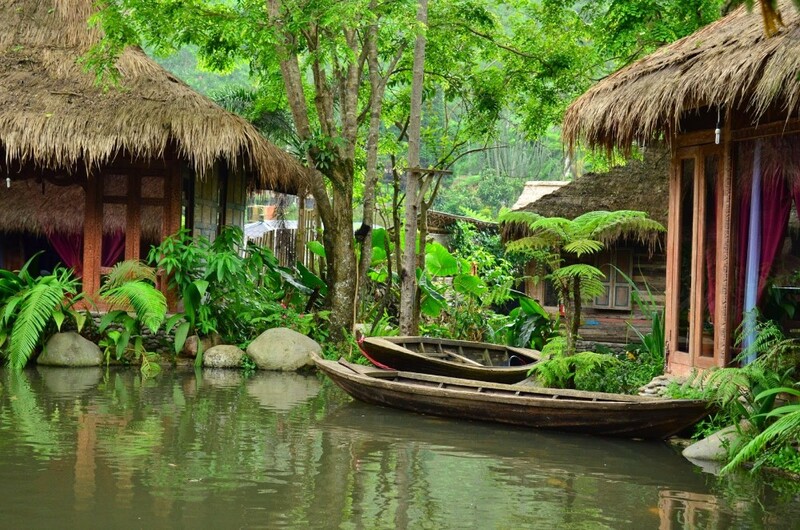 With wooden architecture and clean, simple layouts, Vila Air Natural Resort is the dream abode for nature-lovers. Closely situated to popular attractions such as Dusun Bambu Park, Jendela alam, and Tangkuban Perahu Volcano, the resort is a great stay for those who are interested in exploring Bandung’s natural surroundings. Additionally, there are also a wide range of amenities available at the resort. Guests can enjoy the outdoor pool, have fun at the tennis court, and even get a relaxing massage! One of the most luxurious hotels in Bandung, enjoy fresh air in the highlands when you book your stay at this amazing hotel. Located just 5km away from the airport, Padma Hotel Bandung is an easy entrance in our list of unique Bandung forest resorts & hotels. 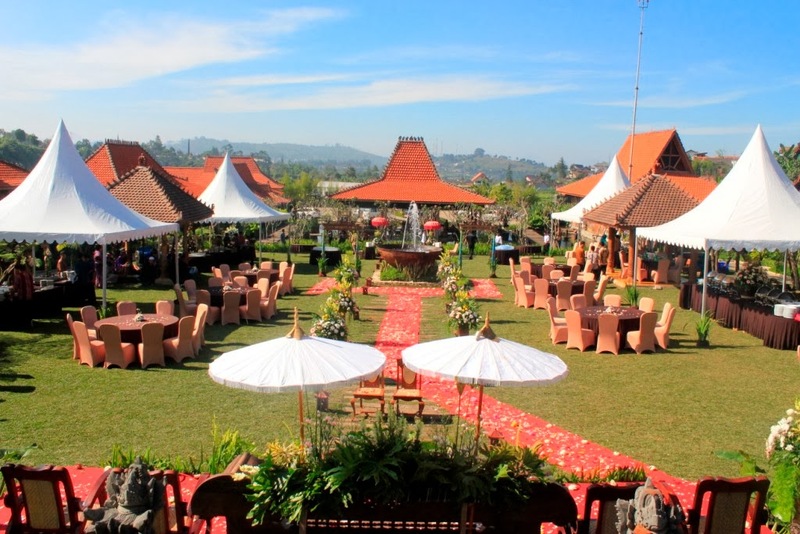 Situated on the hillside, guests can enjoy a misty, breathtaking view of Bandung when they stay at this luxurious hotel. Featuring a host of facilities such as horse-riding, sauna, and also barbecue amenities, having your holiday at this amazing hotel will definitely be an exciting experience! Another hilltop hotel, The Valley Resort Hotel is perfect for those who are looking for a getaway amidst lush greenery. 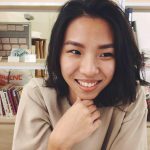 The kampung inspired villas give off an authentic natural environment feel and will be quite a unique experience for guests! What’s more, the hotel is also conveniently located as guests can easily access popular attractions such as Dago Pakar and Dago Indah Golf from here. The airport is also just 7km away, which making this hotel easily accessible for travellers. From on-site golf course to karaoke rooms, guests can enjoy a wide range of activities here. There are also massage services, spa, and sauna rooms for those who want to decompress. 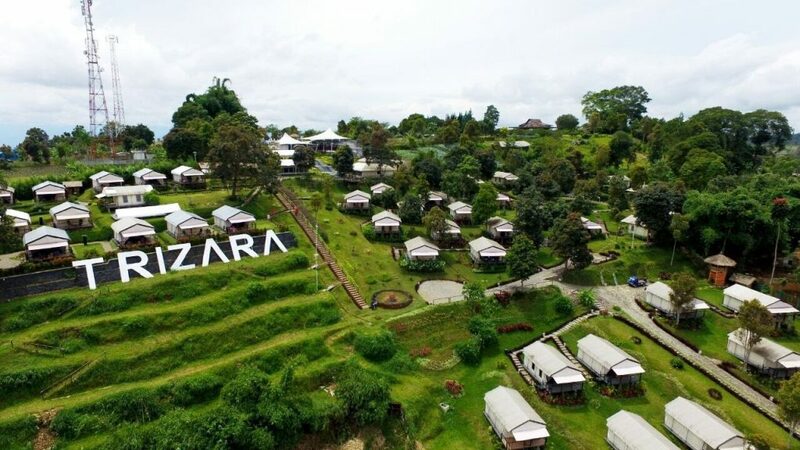 Enjoy the serenity of nature and the comforts of modern living when you go glamping with your loved ones at Trizara Resorts! Located on a hillside, the cosy tents create an intimate setting for a holiday away from the city – great for a romantic getaway or a short trip with your closest friends! Besides getting an immersive experience of Bandung’s natural surroundings, guests can also enjoy drinks at the bar and a pleasant evening barbecue here! The massage services available will also be a great way for you to relax and decompress. Truly deserves to be in every list of top and unique Bandung forest resorts. 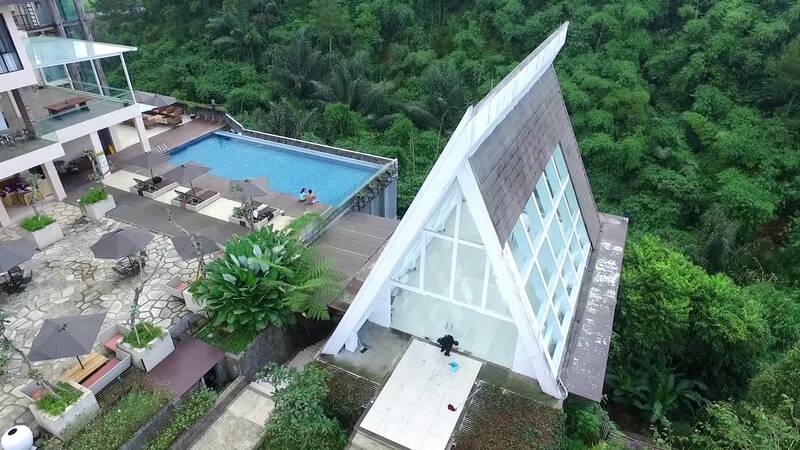 Located in Lembang, Maribaya Natural Hot Spring Resort is the perfect resort for nature lovers! Popular attractions, such as strawberry picking, are easily accessible from the resort and guests can easily explore Bandung’s highlights from this accomodation. What’s great about the resort is that guests can take a dip and relax in the soothing hot springs amidst towering trees. Additionally, they can also enjoy the buffet breakfast served each morning, delectable Indonesian cuisine from the in-house restaurant, and barbecue facilities in the resort. 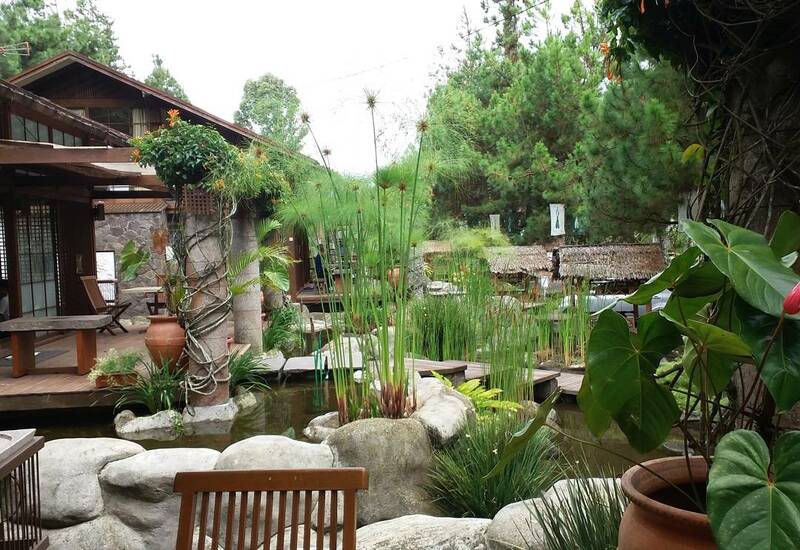 These are just some of the reasons why it gets to our list of Unique Bandung Forest Resorts! 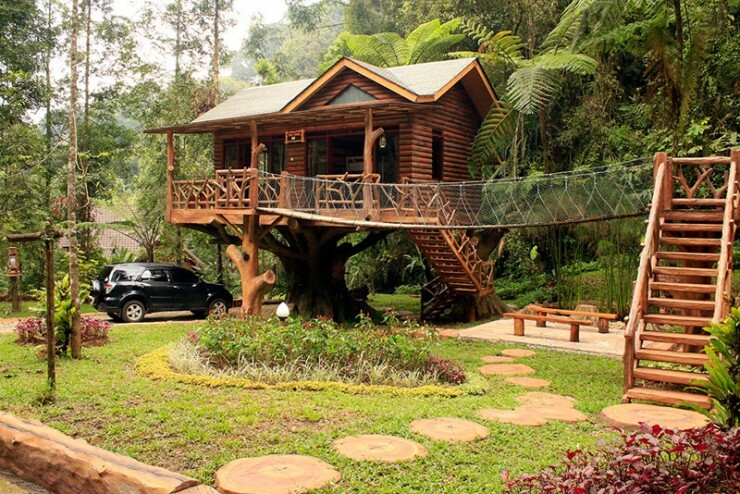 Nature enthusiasts will definitely love this treehouse holiday in Bandung! Situated at the foot of Mount Gede Pangrango, this treehouse stay is great for those who enjoy roughing it out. Nearby, guests will also find the Curung Jaksa waterfall and animals of Taman Safari Indonesia. Staying at this simple treehouse will definitely be an out-of-the-ordinary holiday experience! 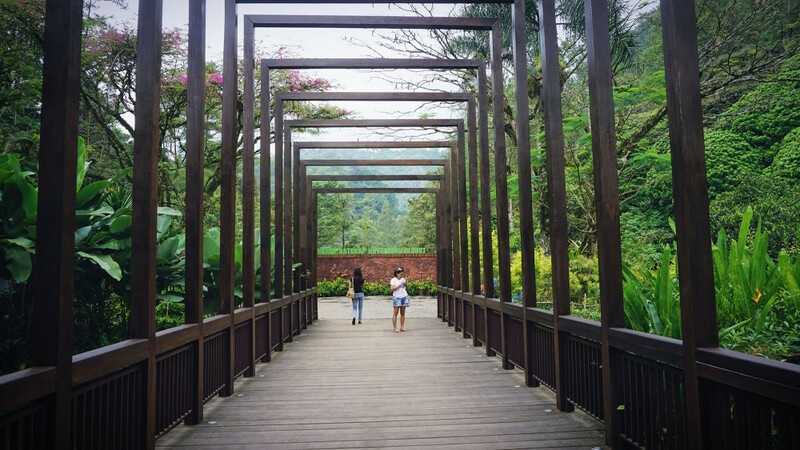 With popular attractions like Jendela alam and Dusun Bambu Park closely located to this resort, guests can easily venture into Bandung’s top nature destinations when they book a stay here. With available car rental and shuttle services, you can also easily access the lively city from this resort. Additionally, guests can also enjoy the spa, hot tub, and relaxing sauna rooms in this resort. With barbecue amenities and cafes available as well, there are more than enough reasons why it’s in our list of unique Bandung forest resorts. Just a ten-minute drive from Kampung Gajah Wonderland, The Green Forest Resort is the perfect place to book a stay for your family and friends! For those who are interested in cultural and heritage sites, you can also visit the Pertapaan Karmel OCD, which is nearby the resort. The Green Forest Resort has a range of restaurants available, as well as amazing 24-hour room services. Those who enjoy physical activities will be glad to know that they can go hiking within the premises of the resort! 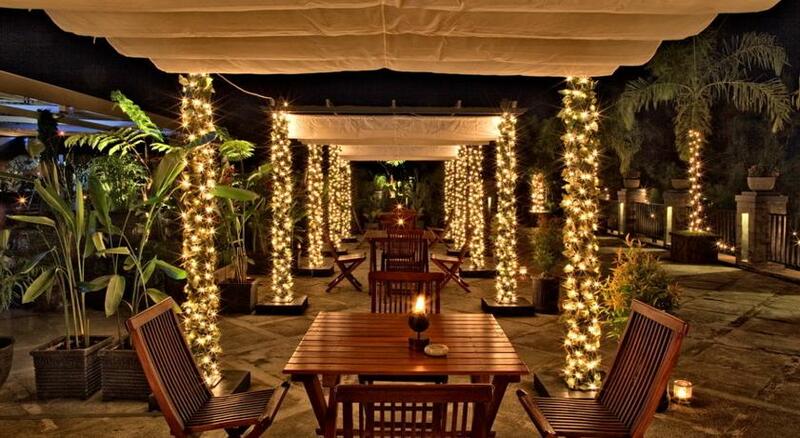 Last but not least on our list of unique Bandung forest resorts is the popular Imah Seniman. With exciting sites likes Boscha Observatorium, Kampung Gajah Wonderland just around the corner, Imah Seniman has a great location. Shuttle services in the hotel also ensures that guests can easily access the lively city centre of Bandung. Featuring kampung style villas, amazing scenery, and a beautiful lake, you’ll definitely enjoy the tranquil retreat this hotel offers. The spa facilities, outdoor pool and horse-riding available are also some fun activities you can enjoy when you stay at this beautiful abode.